Art for me is a divinely creative and deep love affair with my Soul. Each painting I create and birth onto my canvas captures some part of me – unconditional – raw – primal! I allow my intuition, that knowing within – sacred – shadowed – wisdom – to flow from my heart and Soul freely onto my canvas. My painting becomes an adventure and exploration of the ‘unknown’ vast territory of my inner landscape and worlds awaiting to be discovered. These adventures and explorations reap many rewards and blessings of self-awareness – healing – joy – and Love! 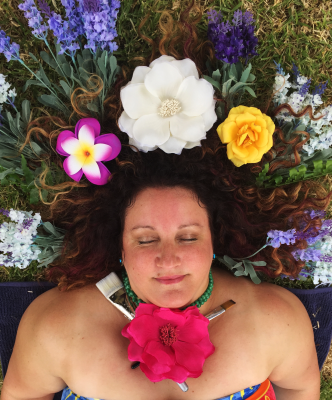 To deepen this experience even more for myself I needed to find a Teacher/Mentor to guide and facilitate this sacred journey within, I was intuitively guided to Flora Aube, Artist and creator of the Art of Allowing Academy. Since May 2016 I have been journeying with Flora, learning to dive deep within mySelf to access and allow my Soul to communicate its wisdom to me through the portal of the Divine Feminine. 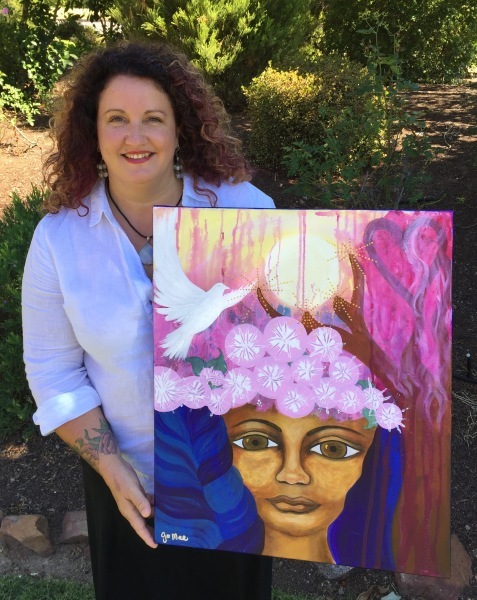 I was so impressed with her courses that I signed up for her Certified Facilitator Training in her ‘Art of Allowing’ process of which I am now fully qualified in, and I am now able to facilitate and guide others through this empowering and sacred journey. Facilitating the ‘Art of Allowing’ process compliments my other vocation as an Energy Healer. I have been a certified Reiki Practitoner since 2009, and have completed a Diploma in Forensic Healing in 2014. I currently run a successful Healing Clinic in my home town of Albury, New South Wales, Australia. If you would like to learn more about the ‘Art of Allowing’ Workshops that I am currently holding please go over to my Workshop page for further information.